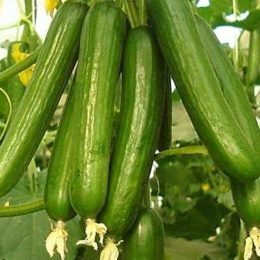 A cucumber with very good heat tolerance – the fruit is uniform in length and has an attractive dark green colour – the disease package is good. Sweet Crunch is an early maturing, Beit Alpha type hybrid with a very high yield potential. Sweet Crunch has a superior flavour, smooth texture and is ideal as a pre-pack type when picked at 12 - 15 cm length. For the ‘gherkin’ market, fruit are picked smaller. The fresh, glossy appearance is very attractive. Sweet Crunch has intermediate resistance against Downy mildew and Powdery mildew. Sunami is an early maturing Beit Alpha type hybrid. It is widely adapted for production in plastic greenhouses. The plant structure allows for easy picking and pruning with a high concentrated set. The fruits are dark green, 15 to 18cm long, uniform, cylindrical in shape with a slight neck. The good shelf life and firmness makes it an excellent variety for the more sophisticated market. Sunami has intermediate resistance to Powdery mildew (Px) (ex Sf) and Cucumber mosaic (CMV).